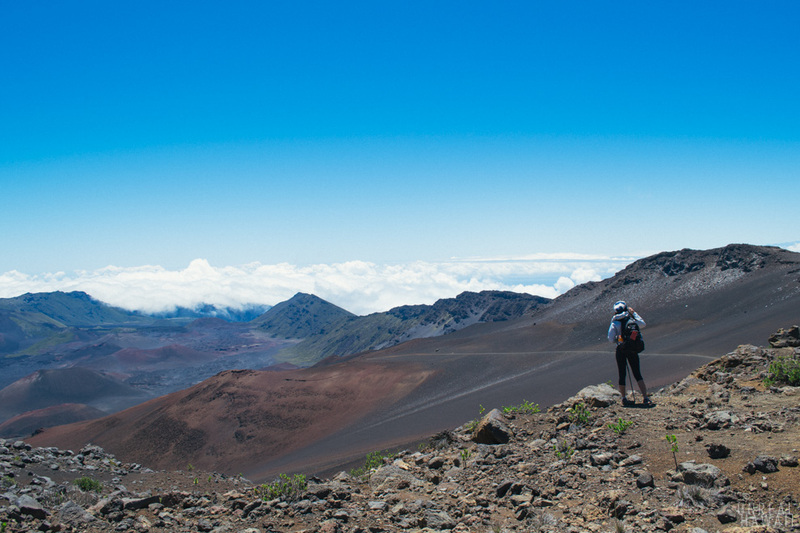 We started the first day of our backpacking trip at the top of Haleakala on Maui. 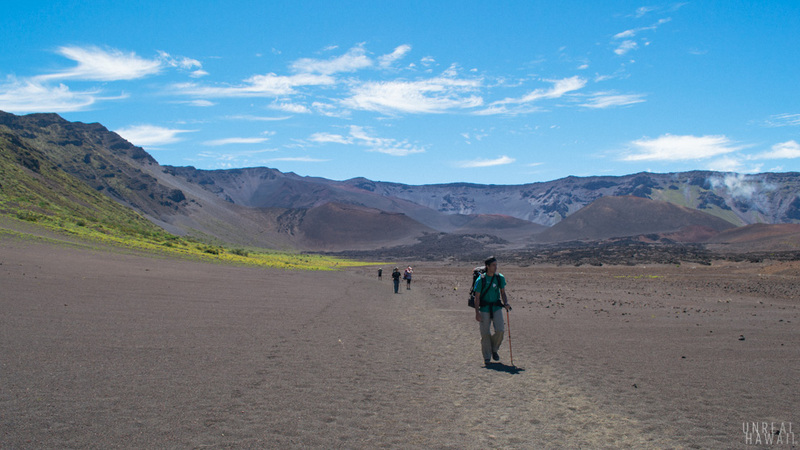 This is the trailhead for the Sliding Sands Trail. 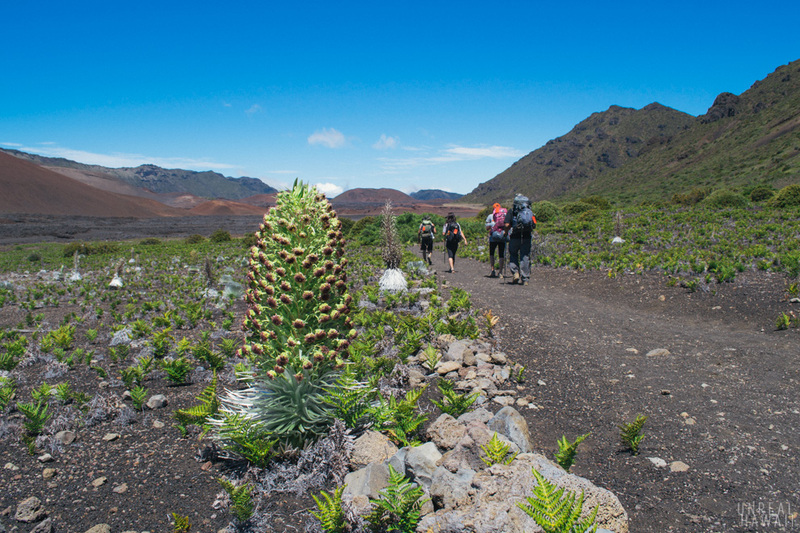 We hiked through some stunning terrain where the silverswords were in bloom (a rare sight as they only bloom from July through October). 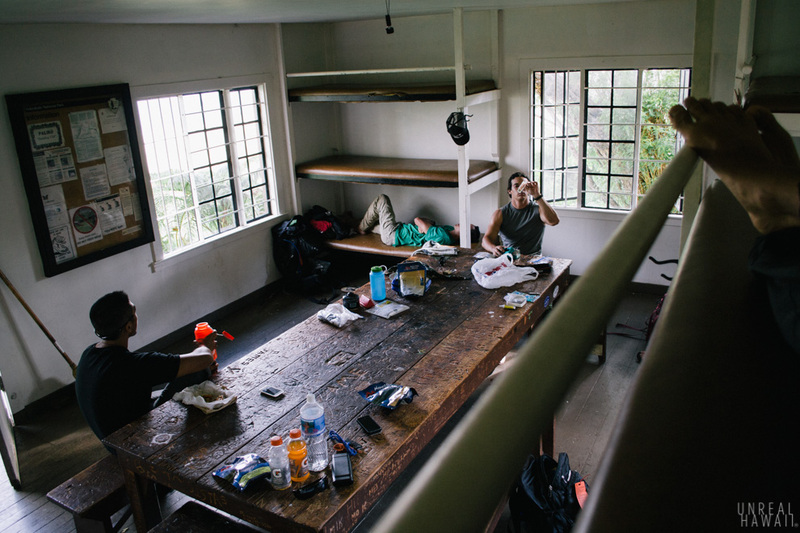 Over 9 miles of hiking later, we arrived at Palikū Cabin. 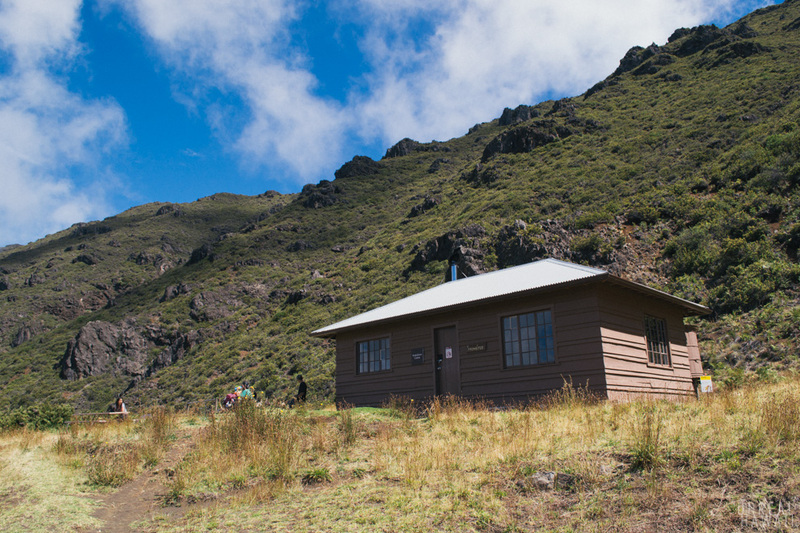 There are three cabins inside Haleakala Crater: Hōlua Cabin, Kapalaoa Cabin and Palikū Cabin. 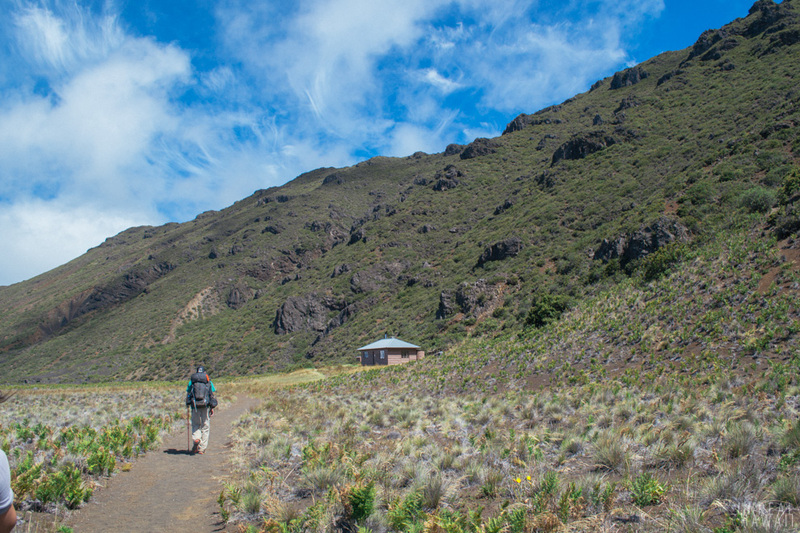 (You can read about the Haleakala wilderness cabins here.) 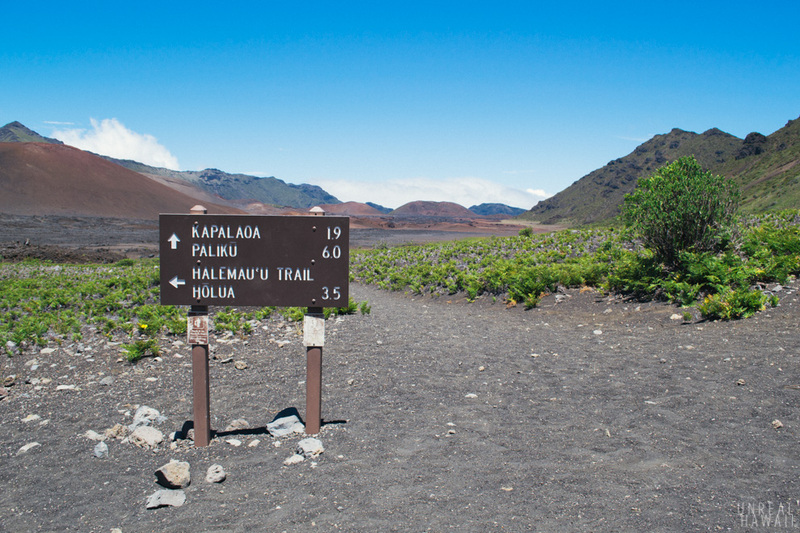 Since Haleakala is a national park, the cabins are maintained by the National Parks Service. That means, they are in very good shape. They have gas stoves, running water (you’ll need to purify it), compost outhouses and 12 padded bunks. 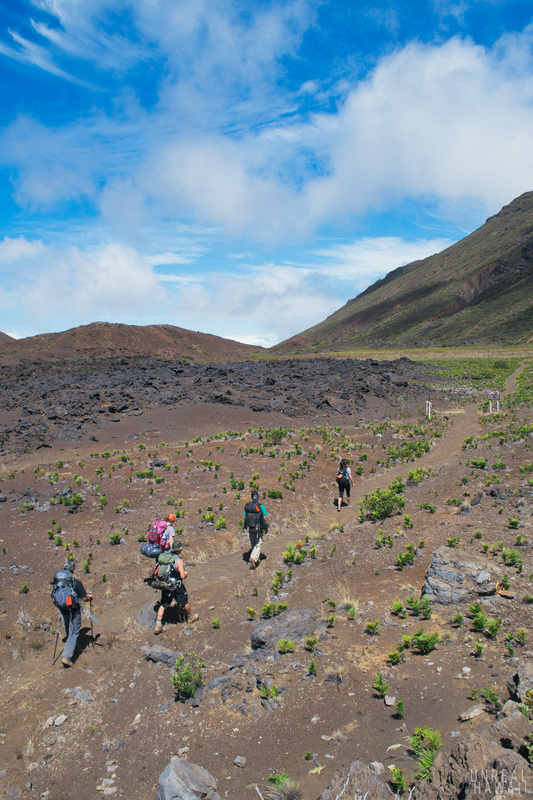 Compared to other Hawaii backpacking trips I’ve done, this was luxurious. The cabins are in high demand though. If you want to make a reservation you’ll have to book the cabins a few months in advance. For this trip, my friend Josh booked two cabins on consecutive days. He specifically booked it for a time when silverswords would be in bloom. 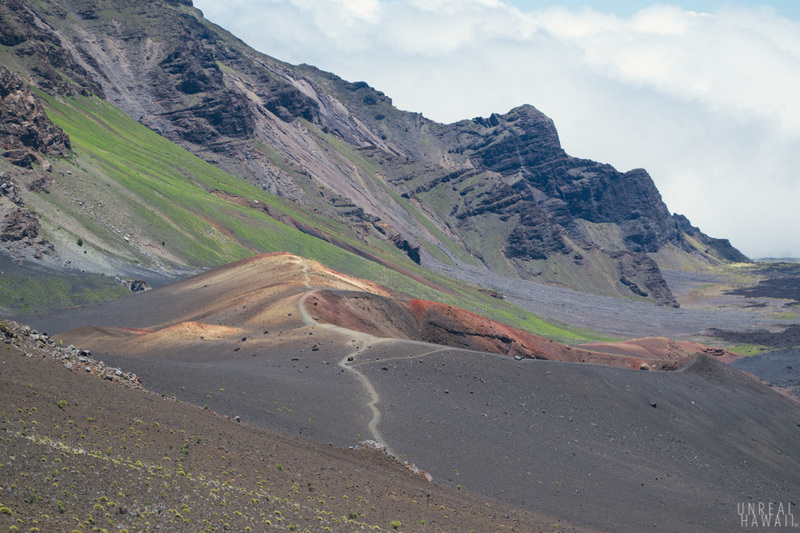 If you look at the map of Haleakala Crater (PDF), you can see that our route forms a triangle inside the crater. This story covers Day 1. 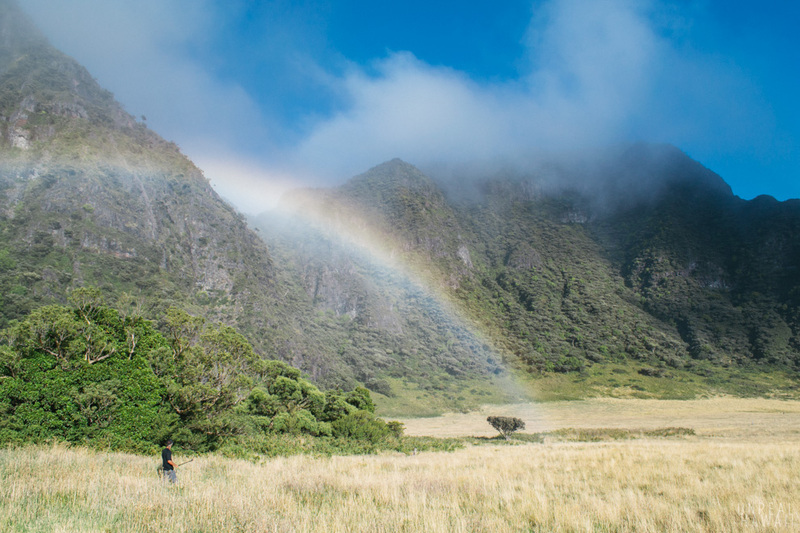 We took the first flight out from Honolulu and arrived in Maui super early. Around 5:40am. After getting our rental cars (we rented two cars), eating breakfast at Zippy’s and picking up some food and water from Walmart, we made our way up the mountain. It takes a little over an hour to get to the top. 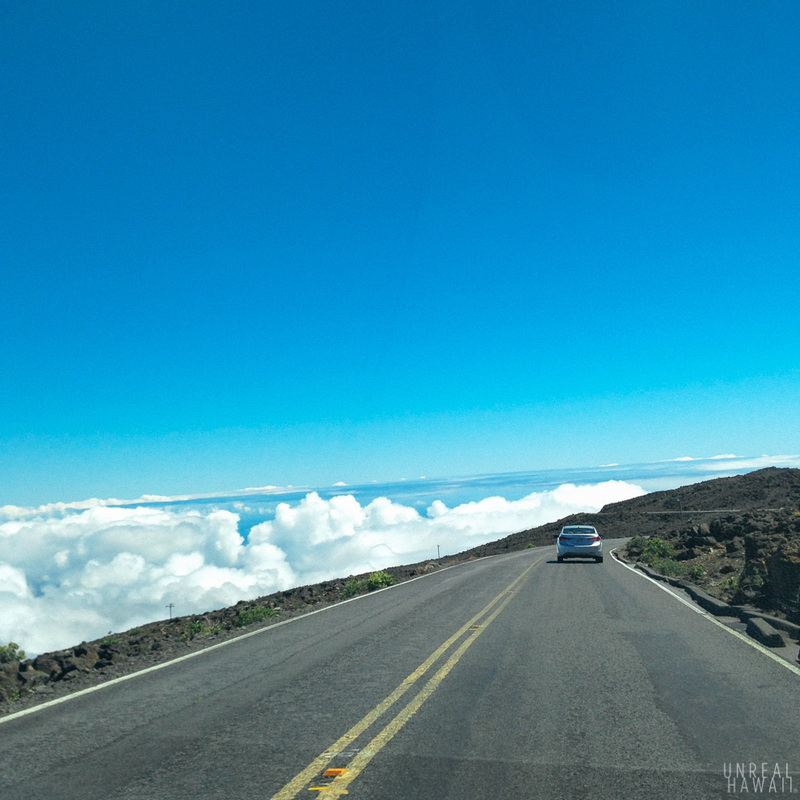 The summit of Haleakala is over 10,000 feet above sea level so as you drive up the mountain you’ll find yourself above the clouds. 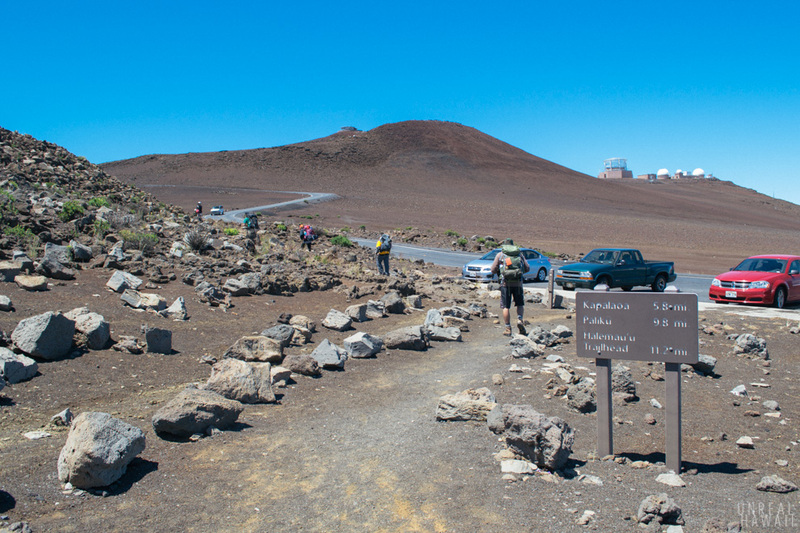 From there we staged one car at the Halemau’u Trailhead (where we would finish our backpacking trip) and drove everyone up to the the Haleakala Visitors Center (a 6 mile drive) where we would park the other car and begin our hike. 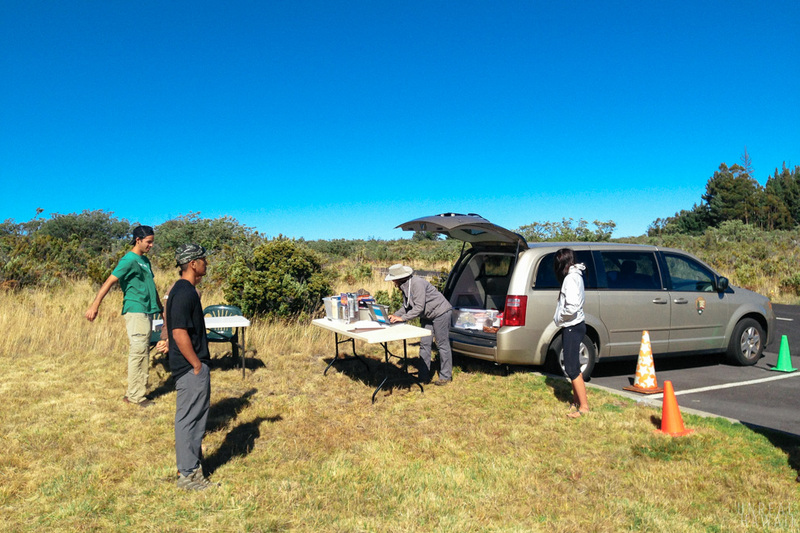 For those that don’t have two cars, it’s common practice for backpackers to hitchhike from the Halemau’u Trailhead to the visitors center. The crew on this trip: me (David), Christina, Josh, Carli, Thomas and Sean. 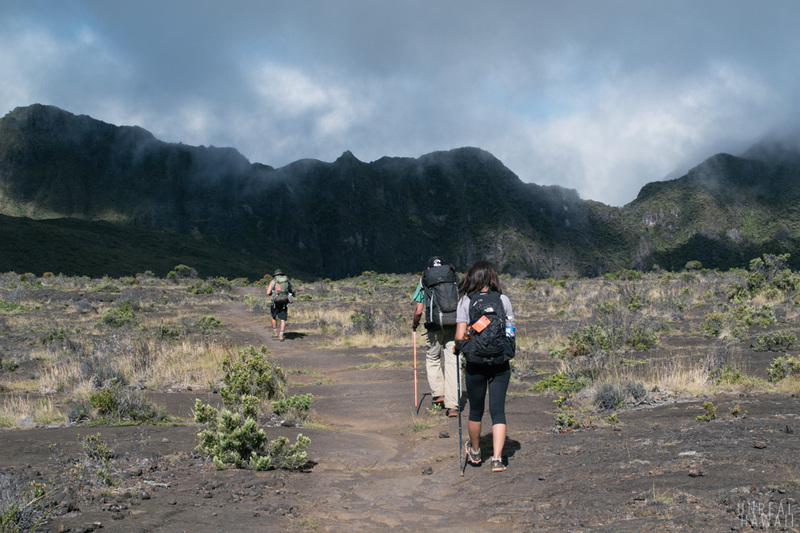 The Sliding Sands Trail (officially known as the Keonehe’ehe’e Trail) takes you straight to Palikū Cabin. The trail is super will maintained. 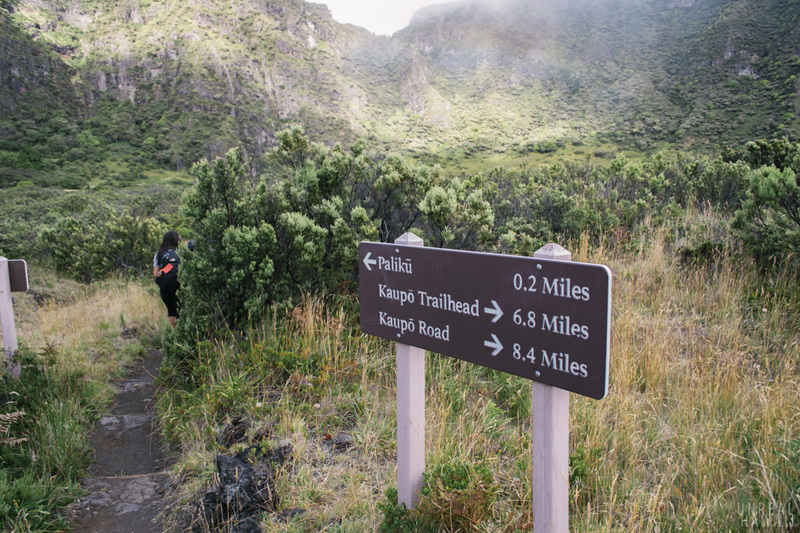 The first section of the trail is a very popular day hike and one that I’ve always wanted to do. It was a treat to be able to hike it all the way to a cabin. It’s also cold at the top. 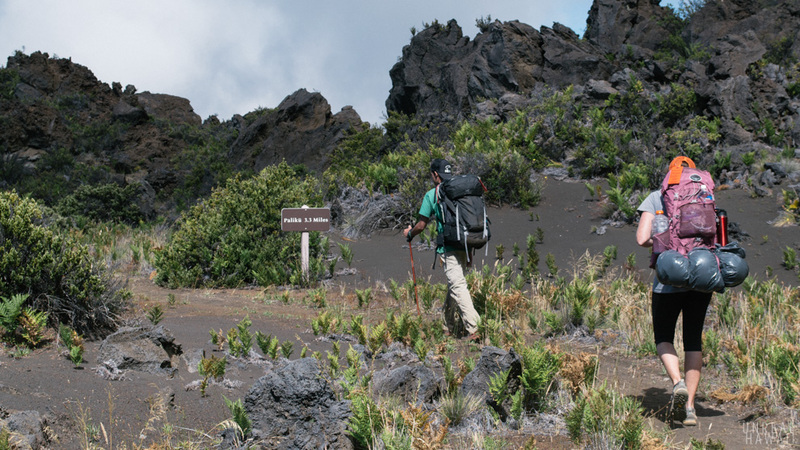 You’ll want to dress in layers because the temperature will warm up quickly as you descend into the crater. Also, the trailhead is something like 9,700ft above sea level so the air is thin. Try to spend at least 15 minutes hanging out around the visitors center before you start your hike to acclimate to the elevation. 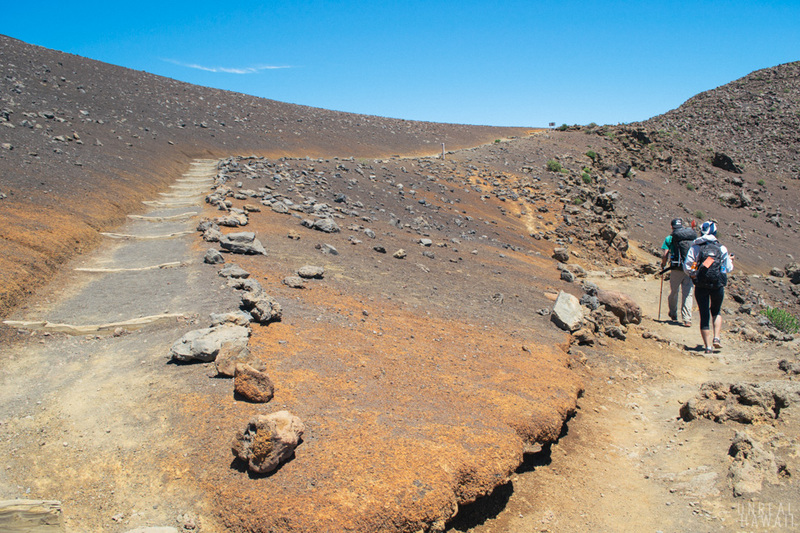 Here’s why this trail has been nicknamed the Sliding Sands Trail. Your path is made up of loose sand. Descending this trail, as we were doing, is easy. The loose footing wasn’t bothersome and no one ever slipped and fell. In fact, it felt nice under our feet. But, if you made yourself a route that required hiking up this trail, I think the loose sand would make the hike more strenuous. 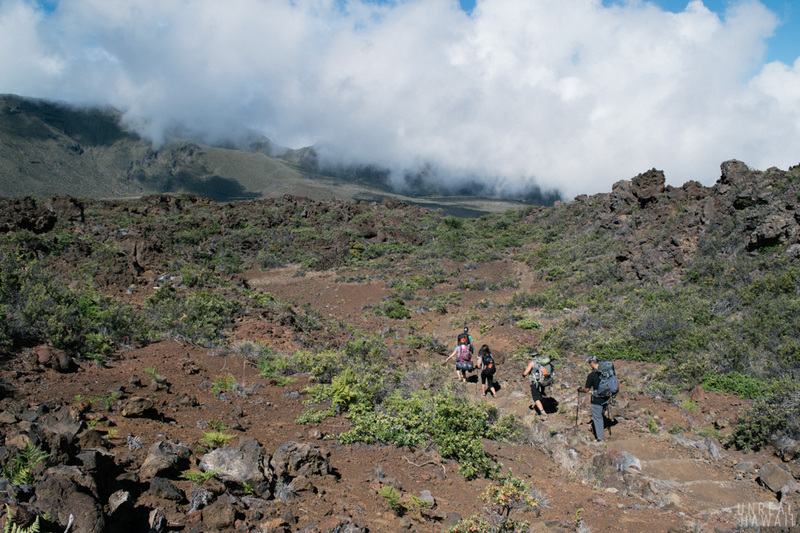 When you hike this trail you’ll feel like you’re on another planet. They call this an aeolian cinder desert. Meaning it was made my aeolians. Which actually means the shape of the surface here was created by wind. 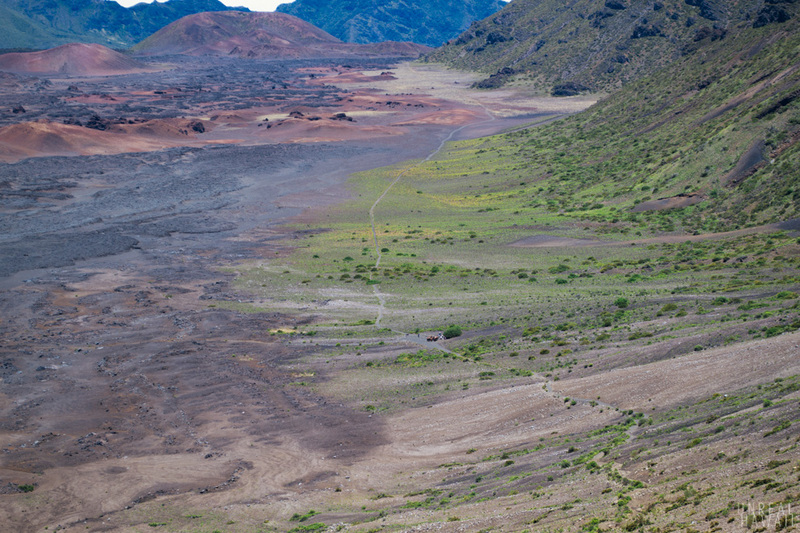 As you descend through the crater the views get better and better. I should note that there are no trees for the first few miles and the shrubbery is limited. This is pertinent information because high elevation tends to make you more thirsty which makes you have to, you know. We all made at least two pit stops at the Visitor Center restrooms before setting off on the hike. 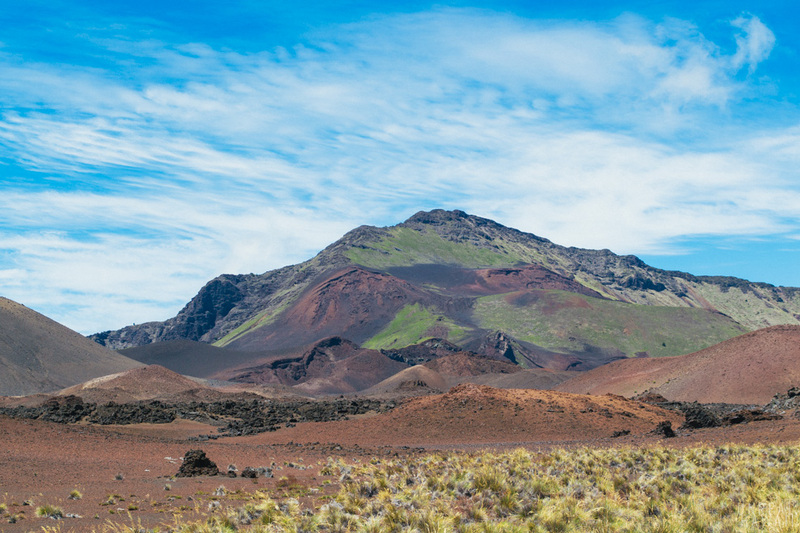 Another look at the aeolian cinder desert. I believe the “cinder” part of that phrase refers to these lava rocks. 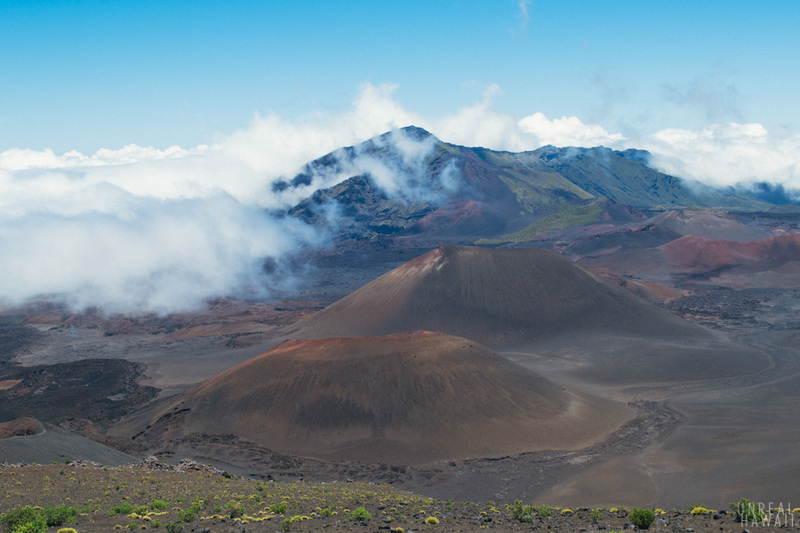 Hiking into Haleakala Crater gives you a better view of the cinder cones. The amount of color in here was surprising. We continued on down a series of switchbacks. You can see the grade of the switchbacks here. My knees where getting a little shaky from all this downhill hiking but I had one trekking pole. Thomas was hiking with two. 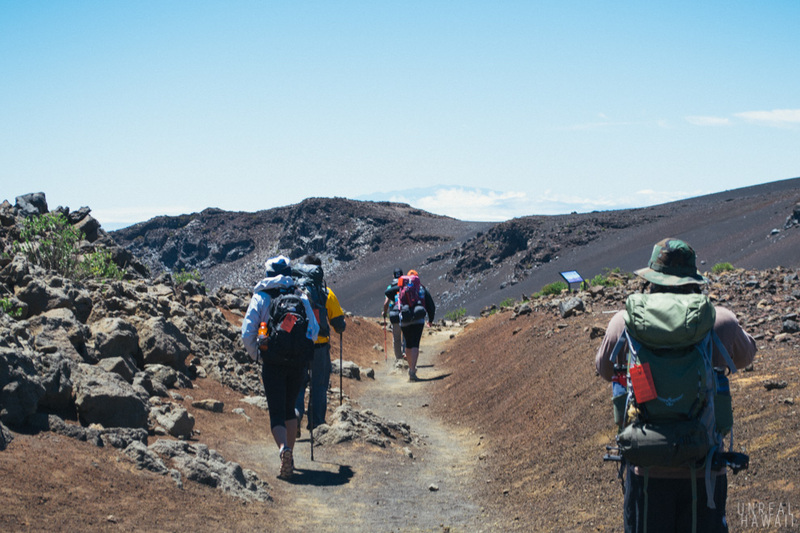 For most backpacking trips, I would recommended bringing at least one pole. 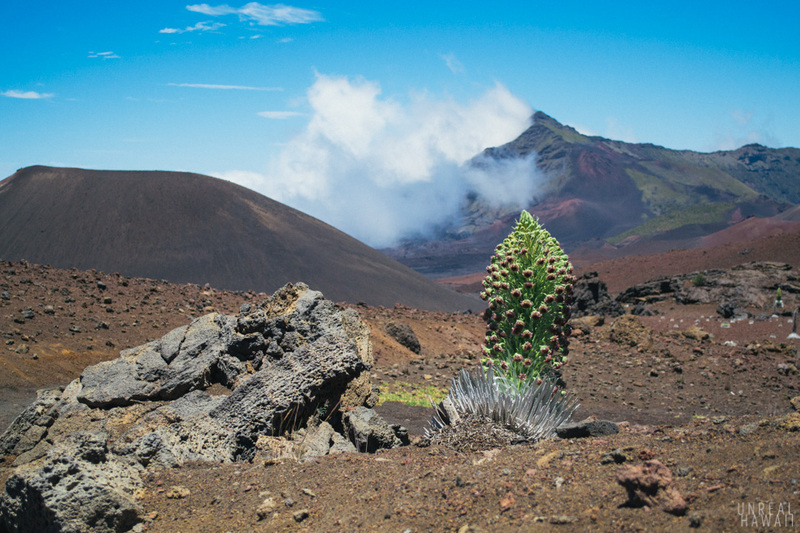 As we were approaching the bottom of the crater, we passed through a cluster of silverswords. It was like being in a Dr. Suess book. 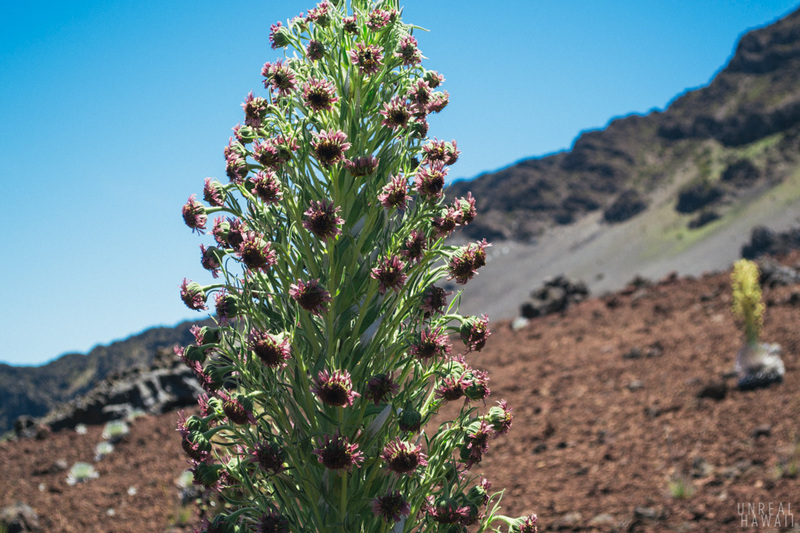 The ‘ahinahina is a perennial plant which can develop from seedling to flower in a s little as three years, but typically requires more than a decade. The plant remains a compact rosette until the final few months of its life. Then the plants send up a flowering stalk with one to five hundered purple flower heads, sets seed, and dies. The silver hairs on the leaves protect the plant from the harsh ultra-violet rays of the sun and aid in water conservation. Silverswords are related to the sunflower. The resemblance becomes more apparent up close. 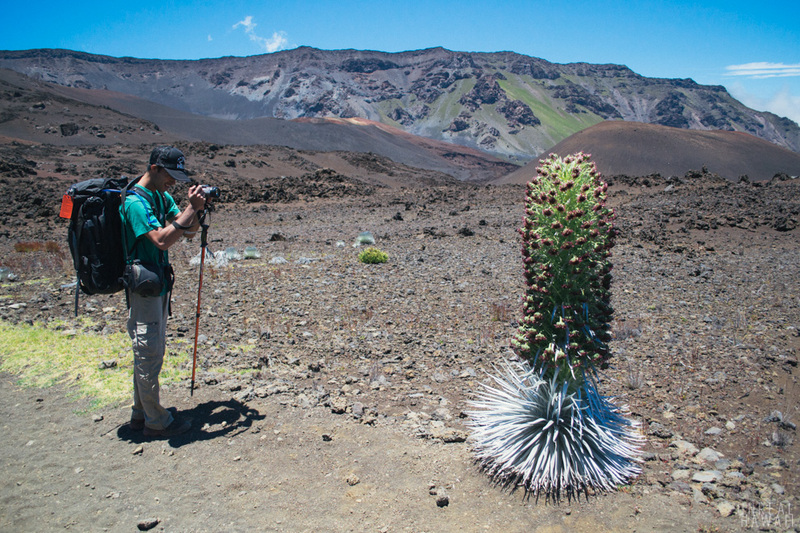 After stoping to take a photo of every flowering silversword we came across we realized that they all looked the same and we should probably save our camera batteries for the rest of our three day adventure. 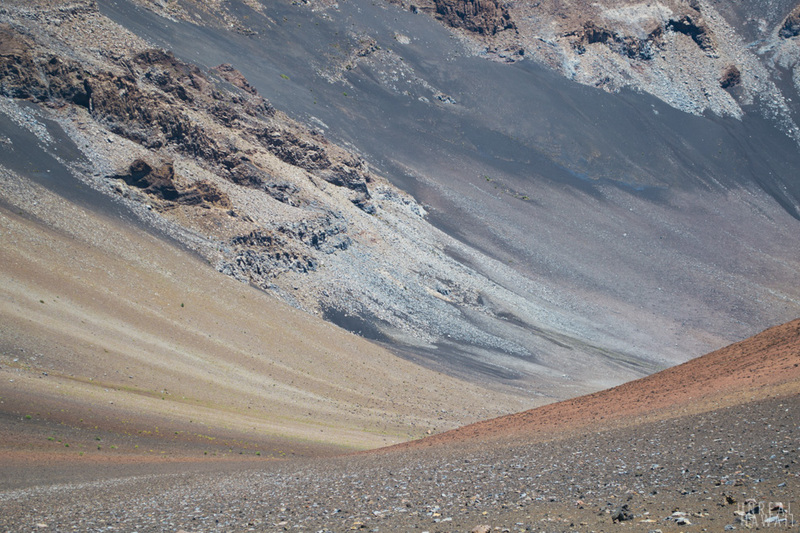 We approached the final set of switchbacks that would lead us down to the flat bottom of the crater. From here we could see miles of the Sliding Sands Trail. 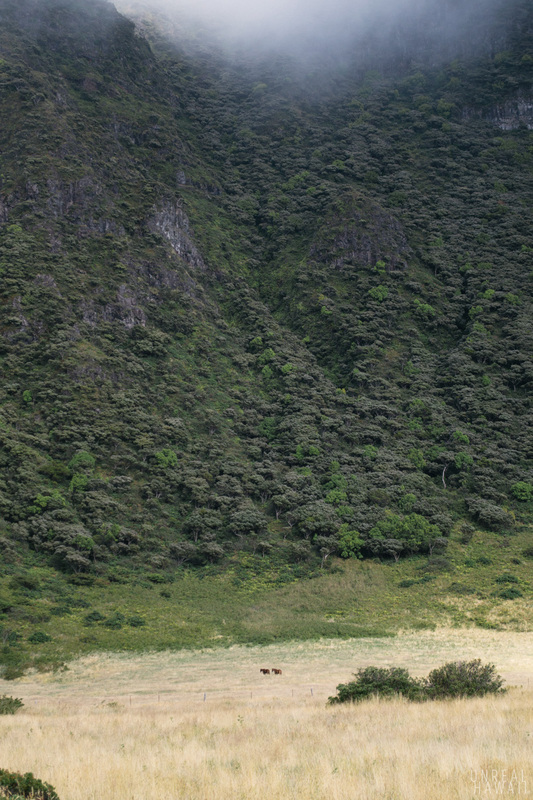 If you squint your eyes, you might be able to see the set of horses in the middle of this photo. 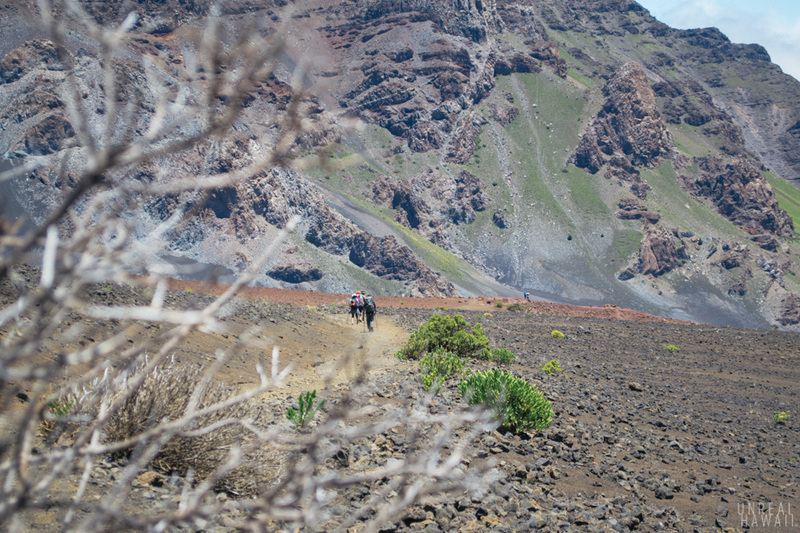 If you don’t want to backpack the trails you can take a horse tour. 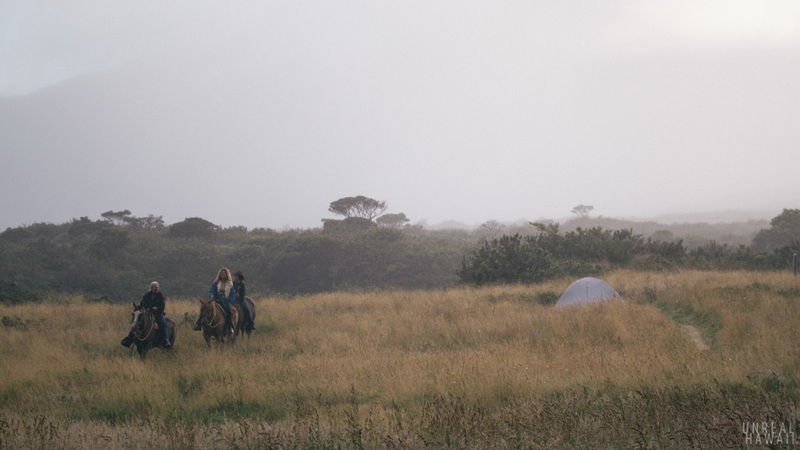 There was even a horse tour that takes you to the camping areas where you can spend the night. At each junction you’ll see signs that tell you how much farther you have to go. We had 6 more miles to go. 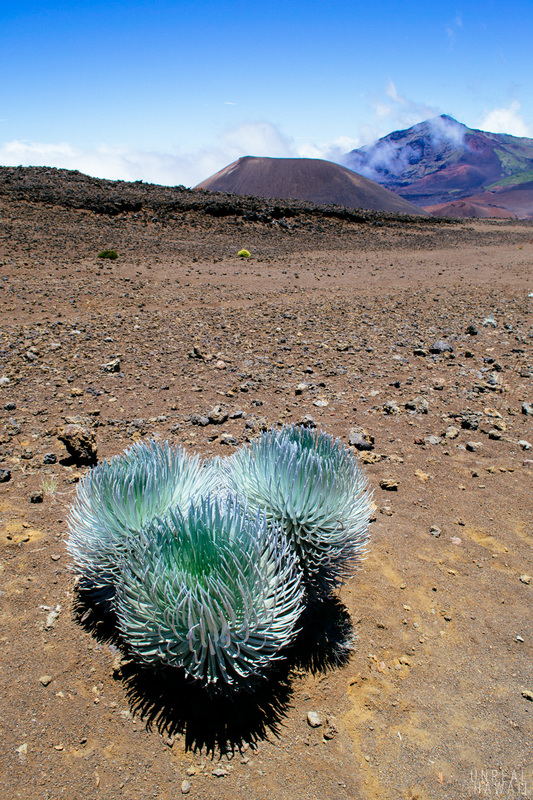 I took one last photo of a silversword. This section of the trail was the easiest hiking for us. The ground was flat and made up of soft sand. 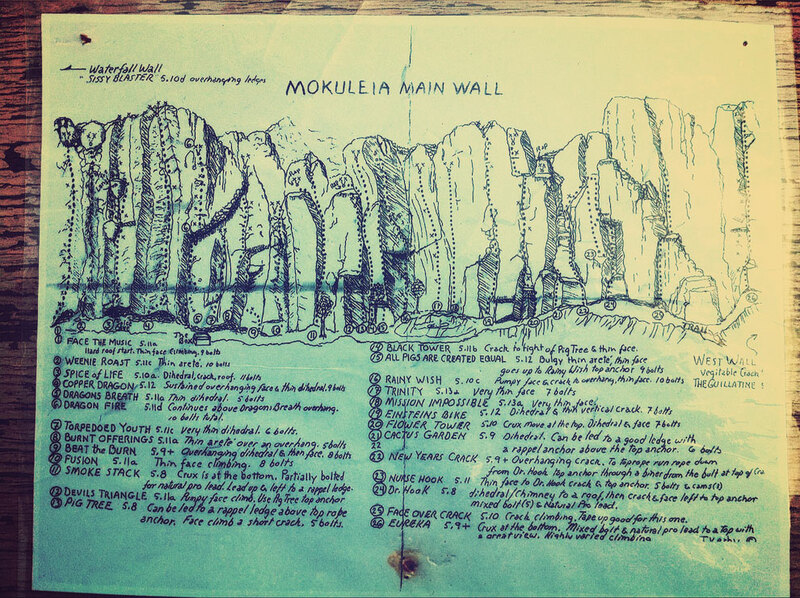 Try to appreciate this as much as you can because, the trail gets pretty rugged later on. Occasionally, we paused to look how far we had come. 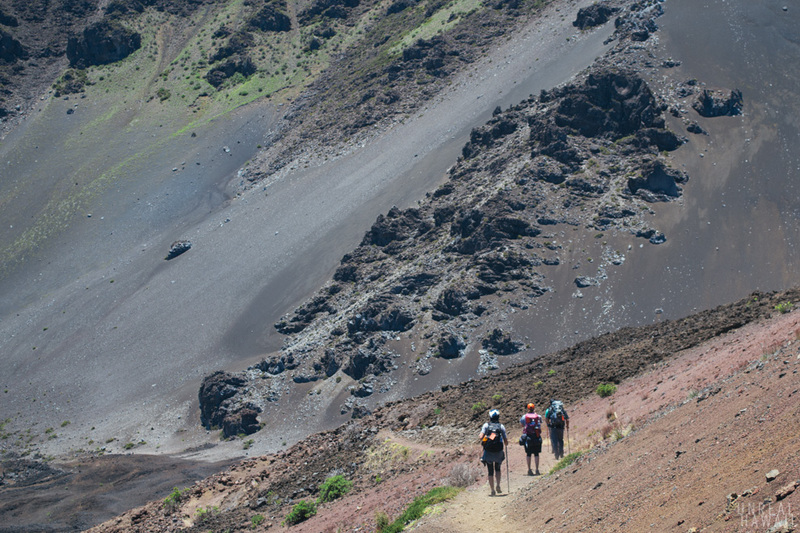 Each time we looked back we were in awe of the natural amphitheater that surrounded us. 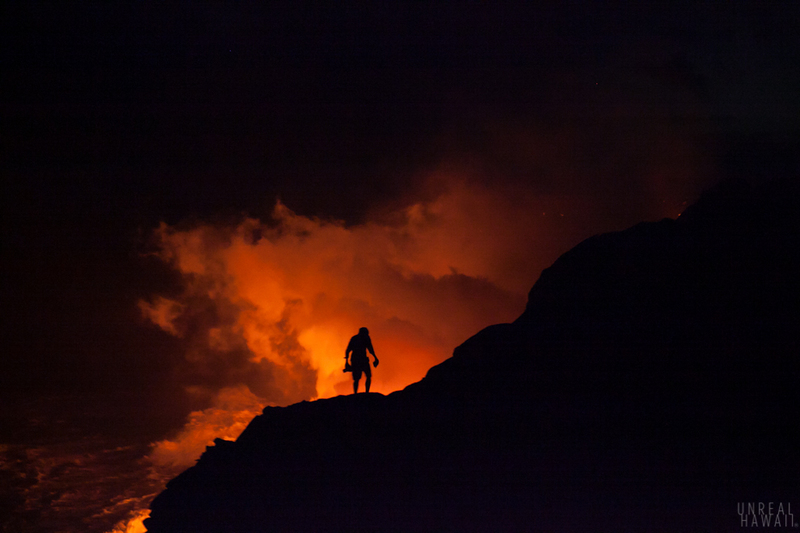 We were in the middle of a freakin’ volcano. 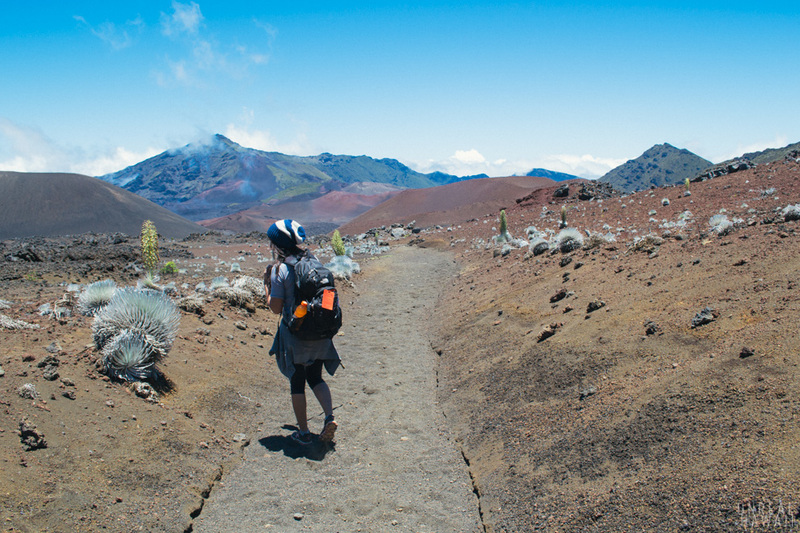 As we hiked the terrain and our view kept changing. On our right there was budding vegetation. 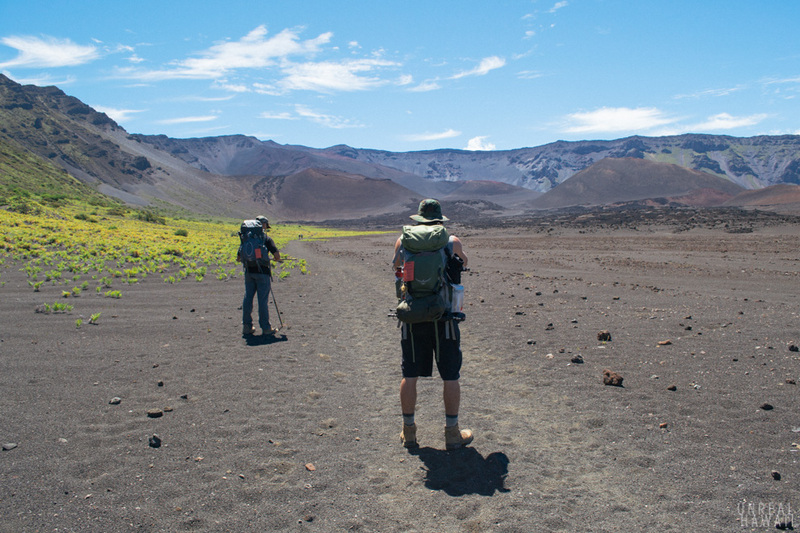 On our left, the earth was still raw and rugged. 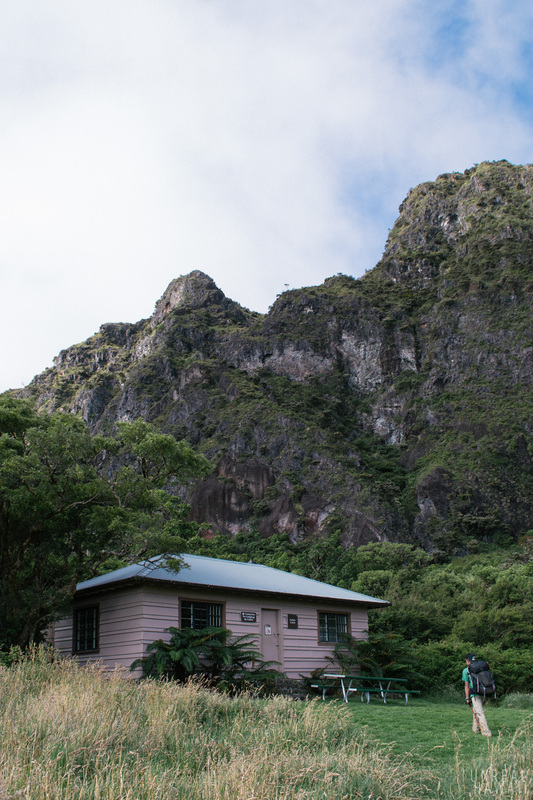 After just under 6 miles of hiking we reached the Kapalaoa Cabin. 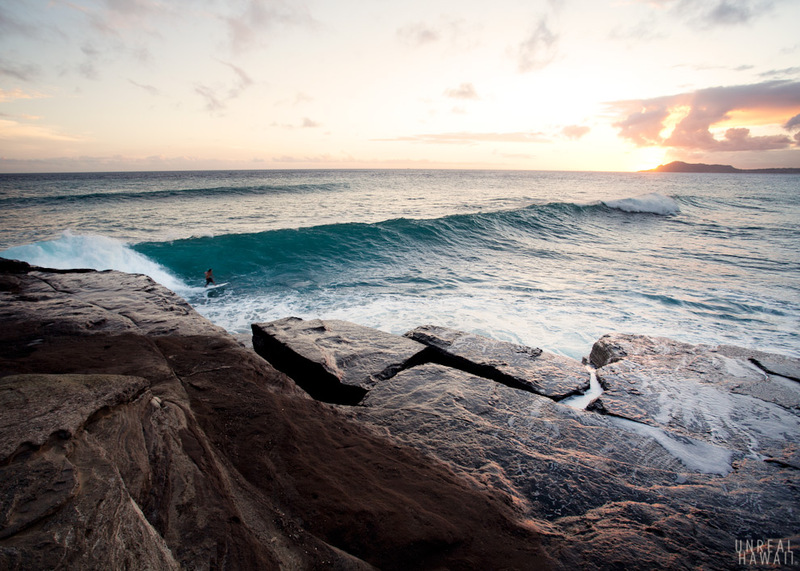 We wouldn’t be spending the night here but this would be a nice place to take a break. The cabins are locked and since there was no one inside, we knew we wouldn’t bother anyone by hanging around in front. If you need it, there’s an outhouse you can use here. 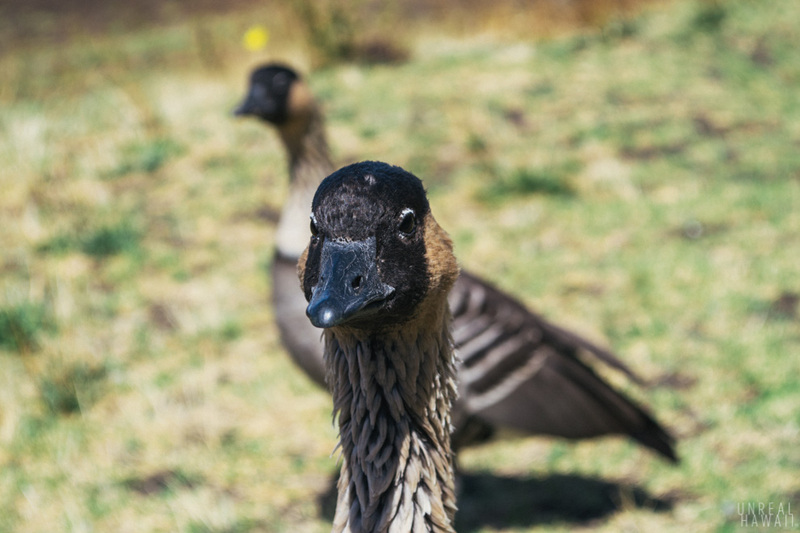 As we sat out front and ate some snacks a couple Nēnē came to say “Hi.” Although there are signs everywhere that tell you not to feed them, it was obvious that these two have been fed by many a human. One of them was tagged. 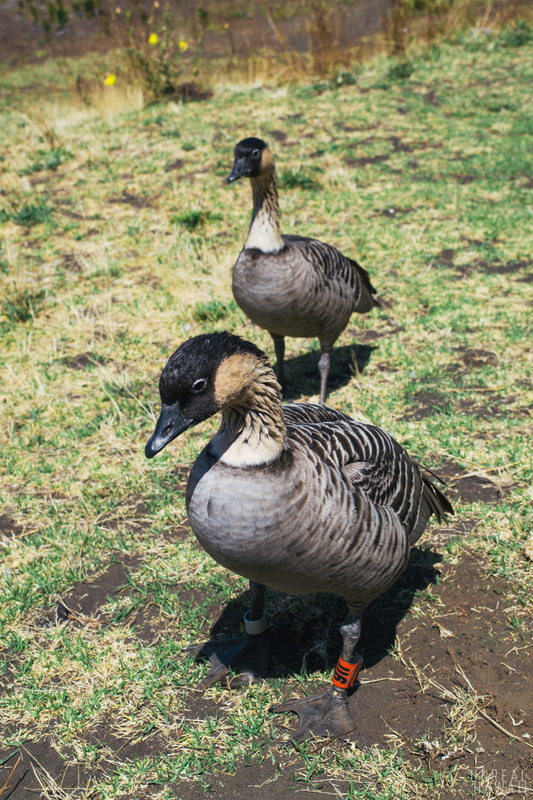 The Nene is the official bird of the state of Hawaii. 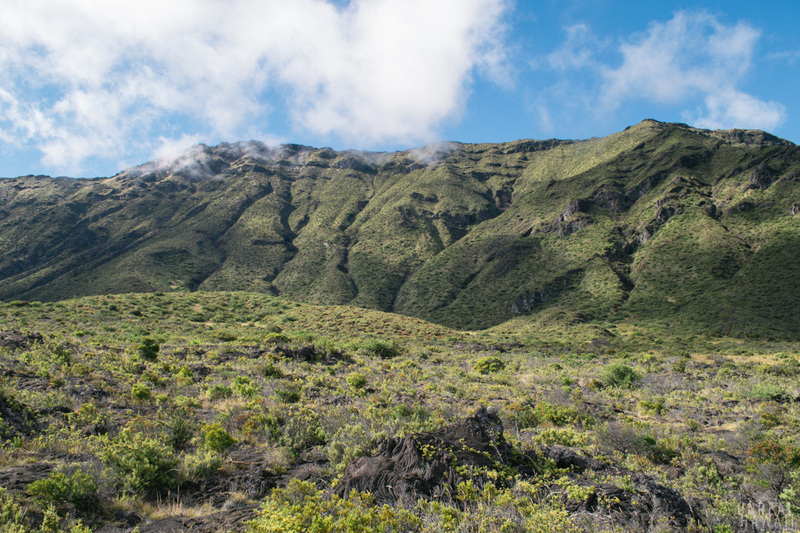 They are endemic to the Hawaii islands (meaning you can only find them here). This was my first time ever seeing one. Pretty cute these guys, sort of, not really. After we had eaten and rested we set off back on the trail. 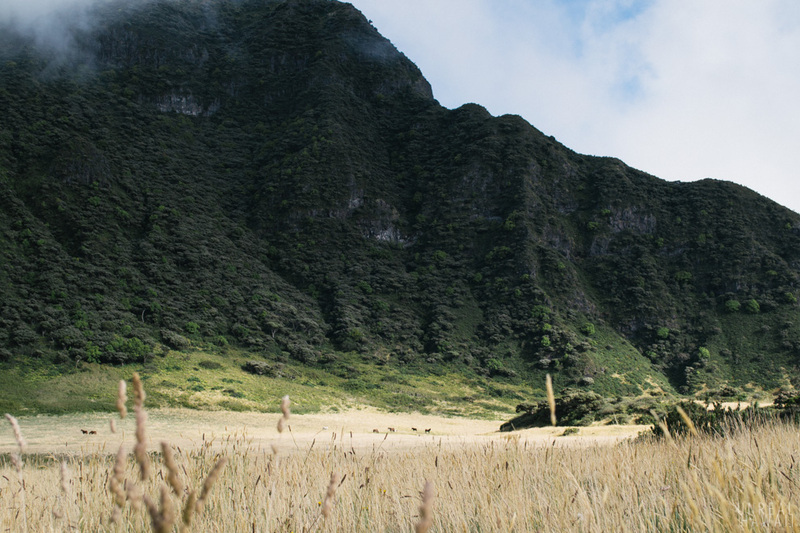 I was actually glad we weren’t staying at the Kapalaoa Cabin as it seemed a little too short a hike to get there. It was almost too easy to get to. 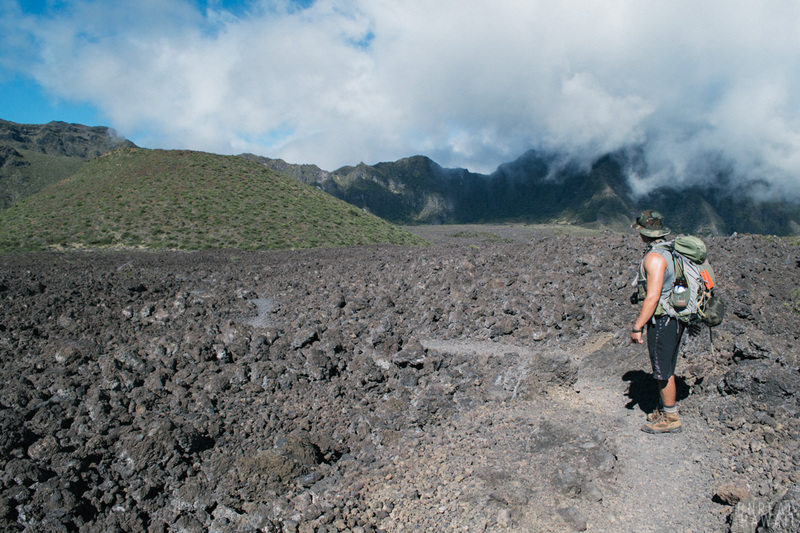 So, we trekked on deeper into the crater. 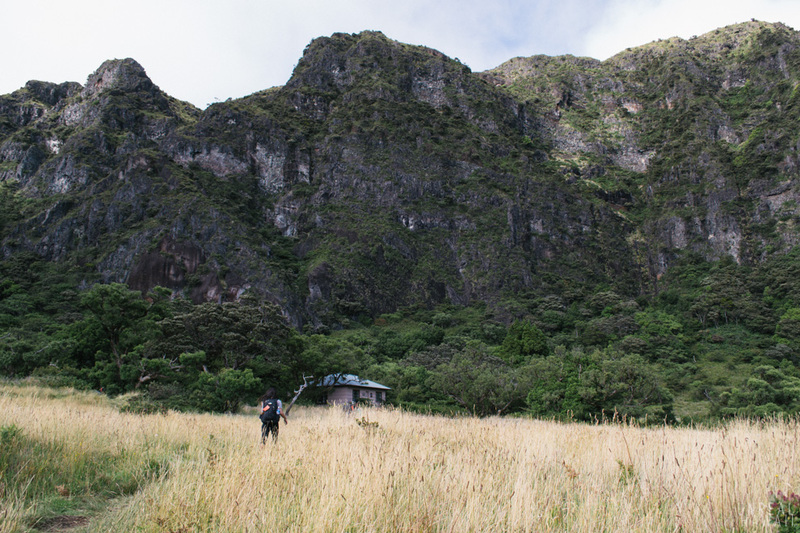 As you hike to Palikū, you’re actually loosing elevation. 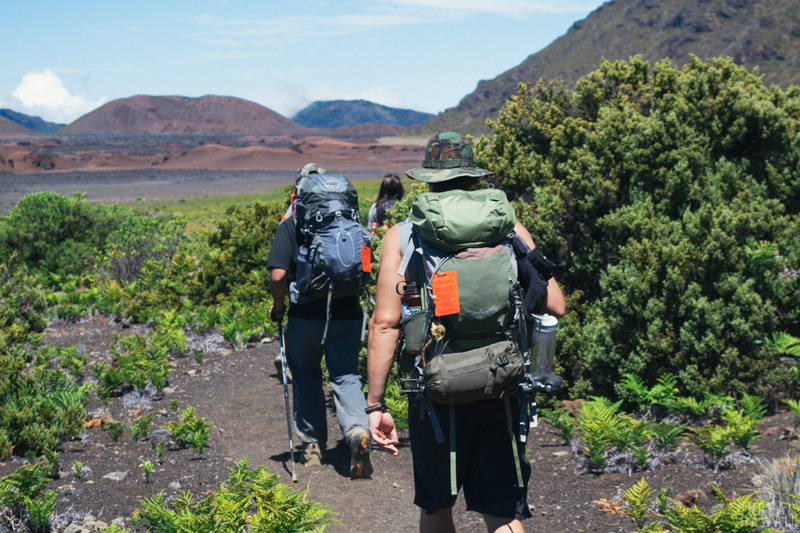 You’re hiking East (towards Hana). 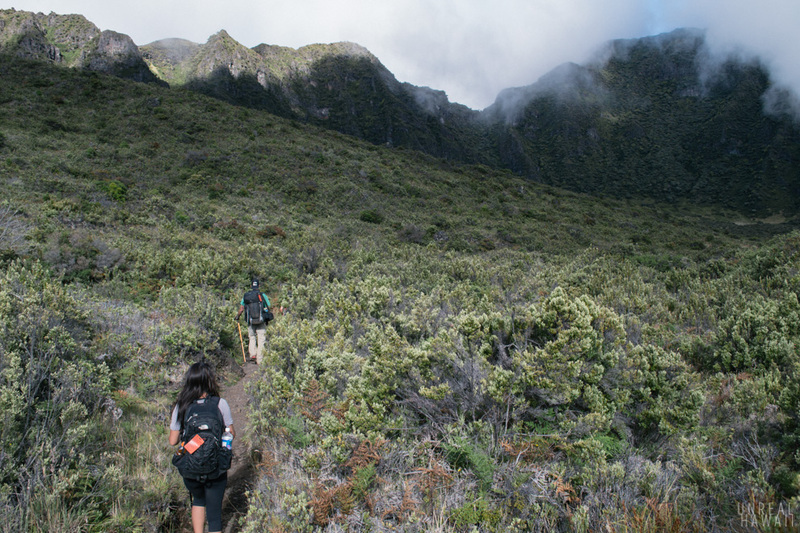 Because of this, the closer you get to Palikū, the more vegetation you’ll see. 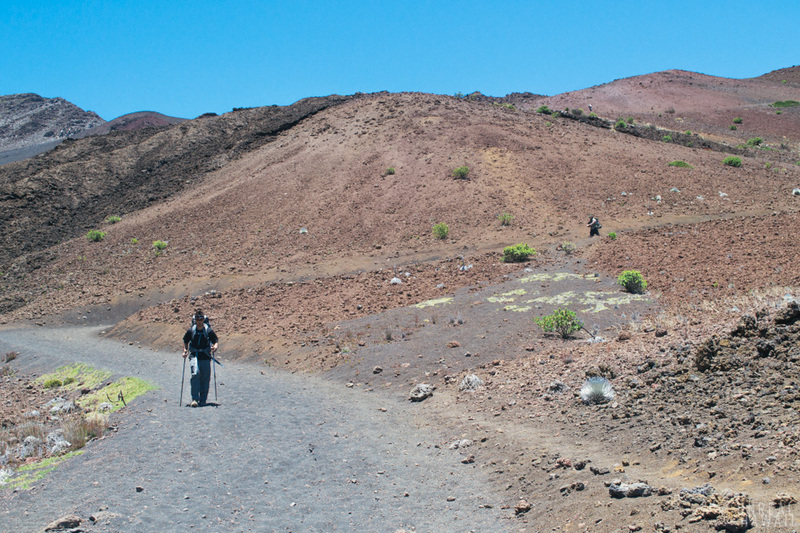 What also happens is all that nice soft aeolian cinder desert sand disappears and your trail gets really rocky. Remember when I said it got rocky in that last sentence? I wasn’t lying. 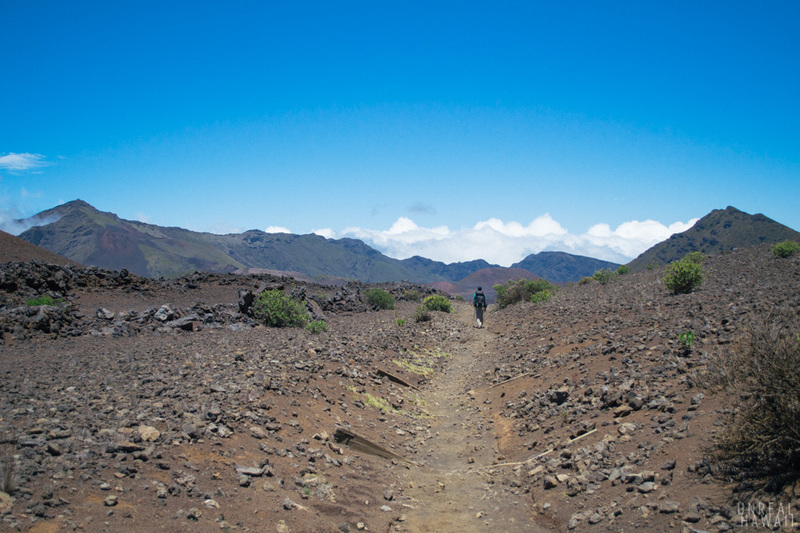 The trail become a path made up entirely of small rocks. 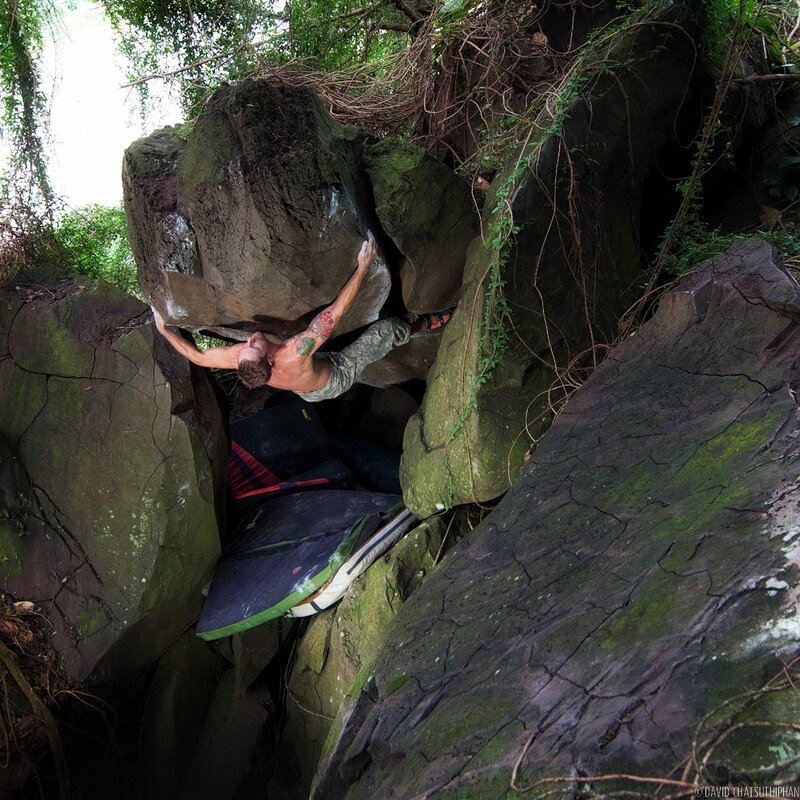 Prepare to have sore feet. 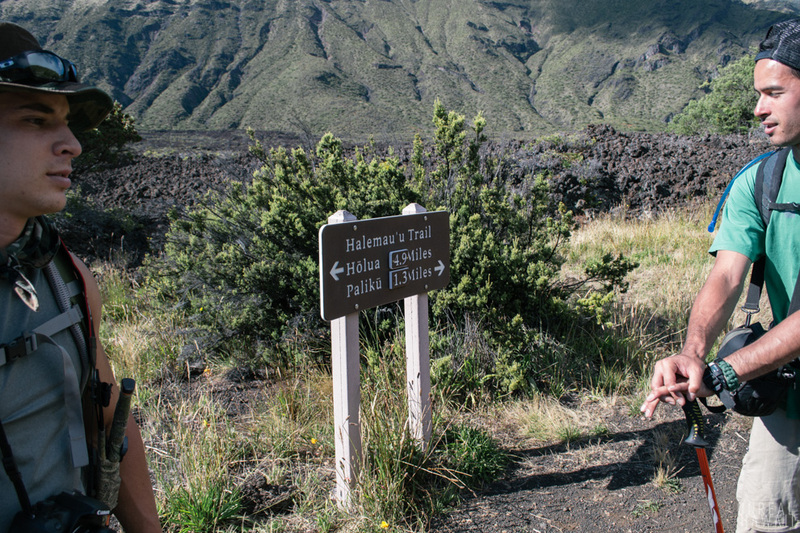 We finally reached the junction where our trail met with the Halemau’u Trail and there was only 1.3 miles to go. Our feet were pretty tired at this point. The trail smoothed out here a bit which was nice. The view in front of us was amazing. Now that we were approaching Palikū, everything changed. 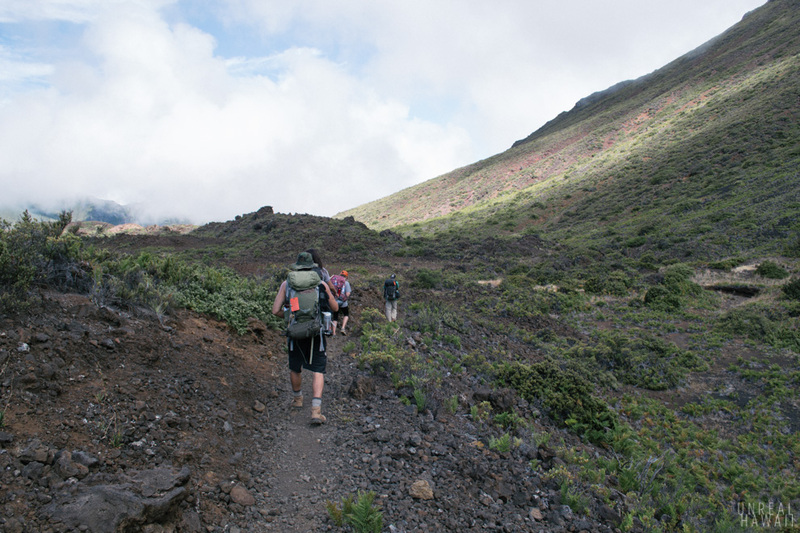 We got to see our terrain go from barren desert to a relatively young rainforest. We had now reached Palikū. This sign was a sight for sore eyes. 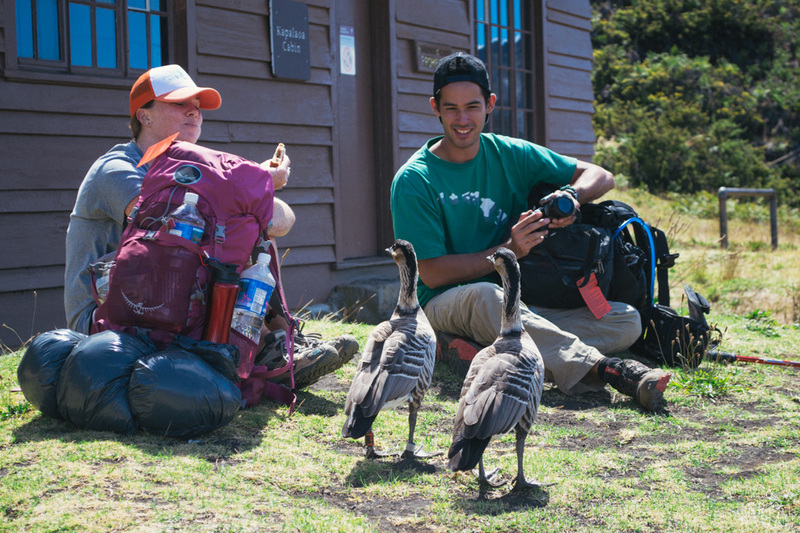 Everyone was pretty tired from this first leg of backpacking. The landscape we saw was completely unexpected. 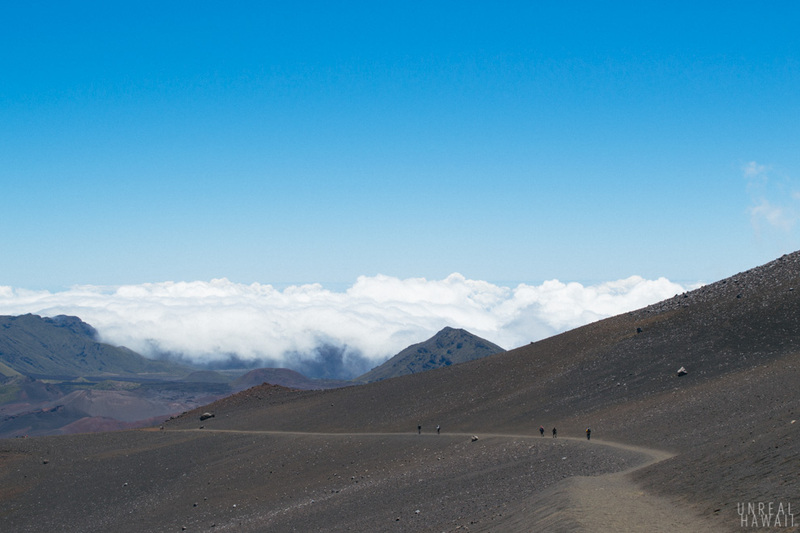 I had no idea the inside of Haleakala crater could look like this. 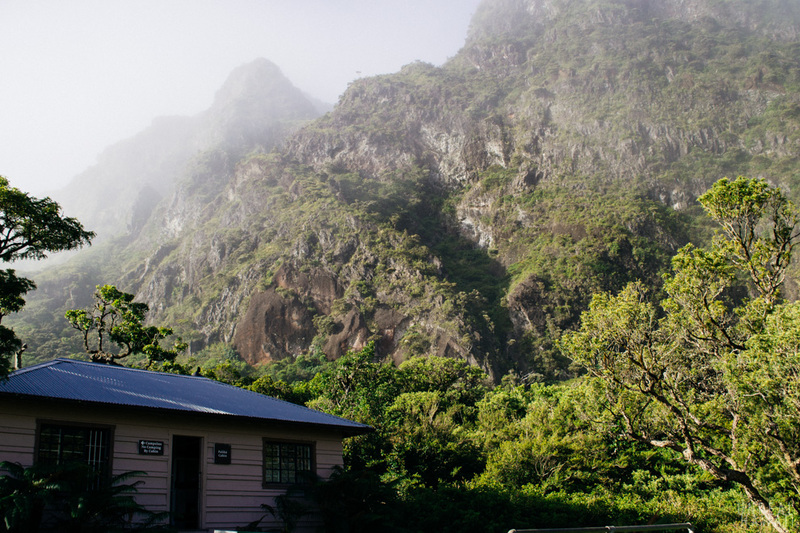 The Palikū Cabin has a stunning backdrop of steep rainforest cliffs. Horses roamed the fields of tall grass. We approached our cabin hungry and ready to rest our feet. Everything was locked up and Josh had the access code. 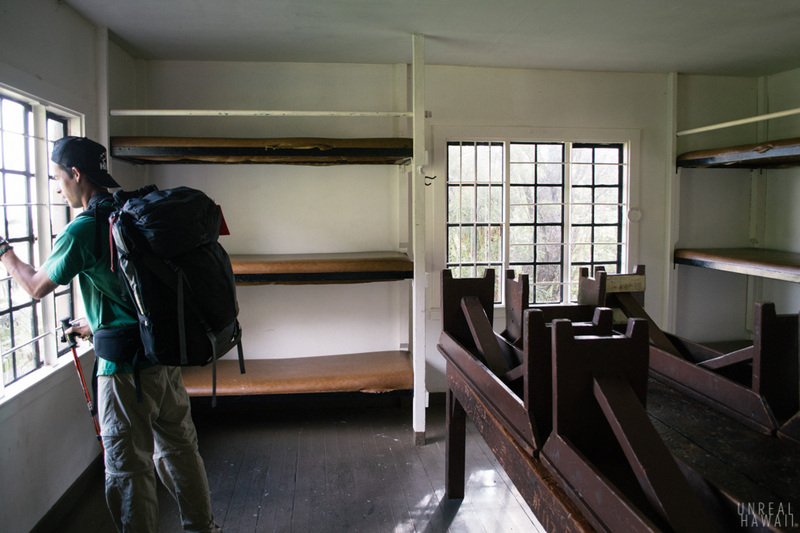 Inside the cabin there were twelve bunks, and a big wooden table. 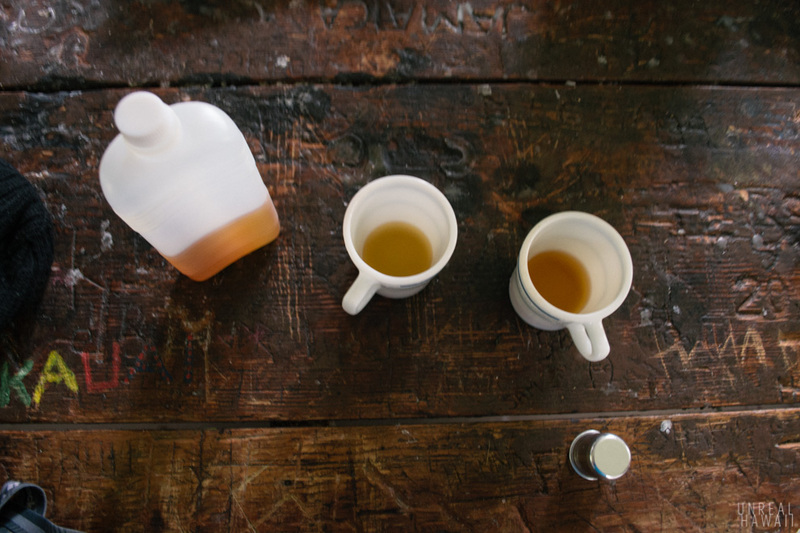 The kitchen has running water (which you’ll need to purify and conserve) and comes stocked with all the cookware, eating utensils, plates and cups you need. There’s also a gas stove and wood burning furnace (for heat). 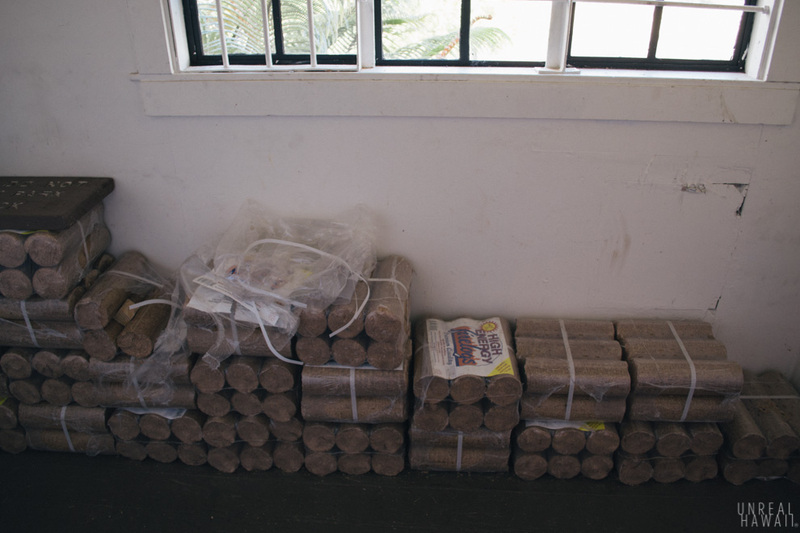 It gets really cold here at night so firelogs are provided for the furnace. First thing everyone did was take off their shoes and put on slippers. 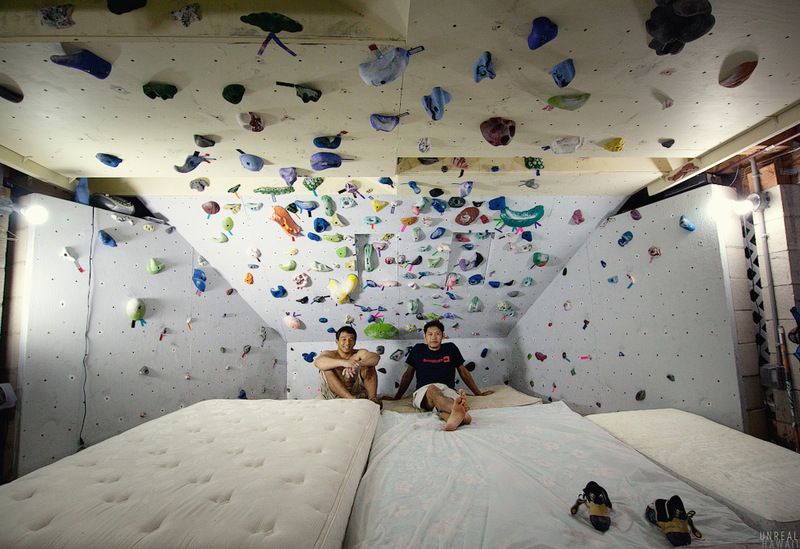 The bunks were comfy. Each one looked newly padded. Then we walked outside and saw this rainbow. 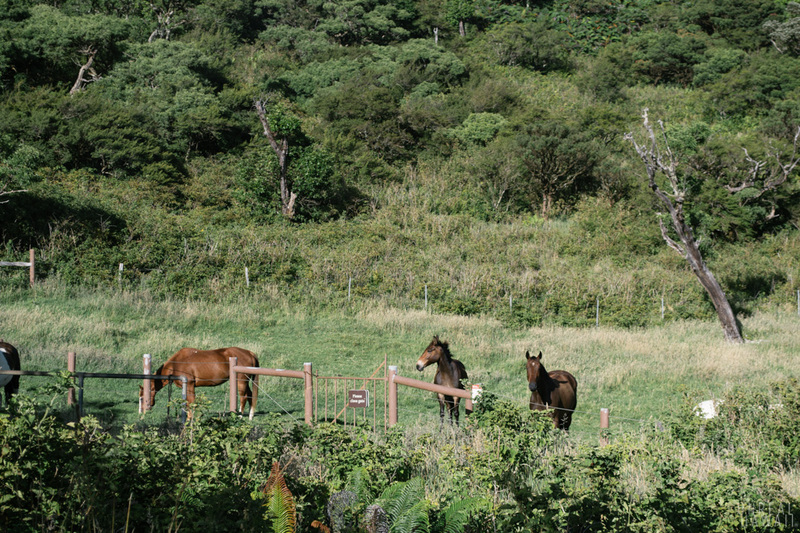 A tour group on horses occupied a cabin nearby. They trotted through the grass looking like they were in some Brad Pitt movie. Campers occupied tents around the area as well. As the evening approached we cooked up our meals. We brought an extra stove as a back up in case the one in the cabin was broken or out of gas. 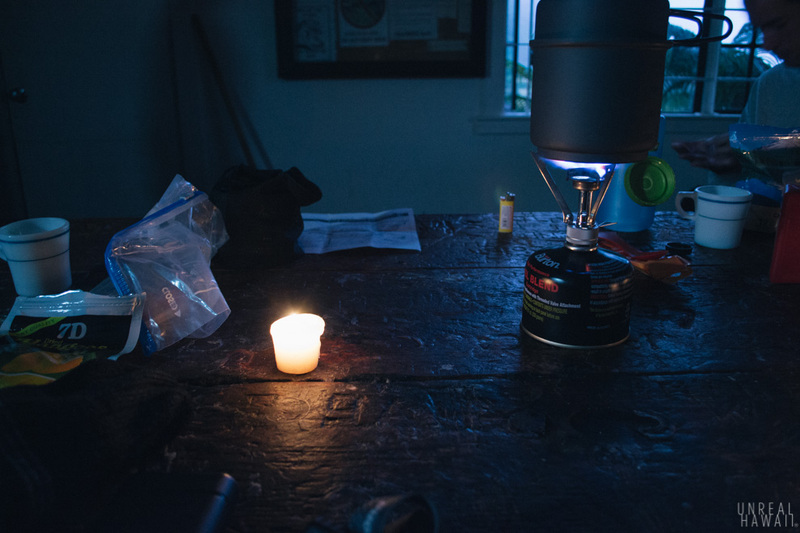 We ended up using both the cabin stove and our camp stove so we could prepare our meals faster. There are no lights in the cabin but someone had left candles. We also had our headlamps. After over 9 miles of hiking, some scotch seemed well deserved. It rained during the evening so we stayed in the cabin. No one minded though. We were tired. 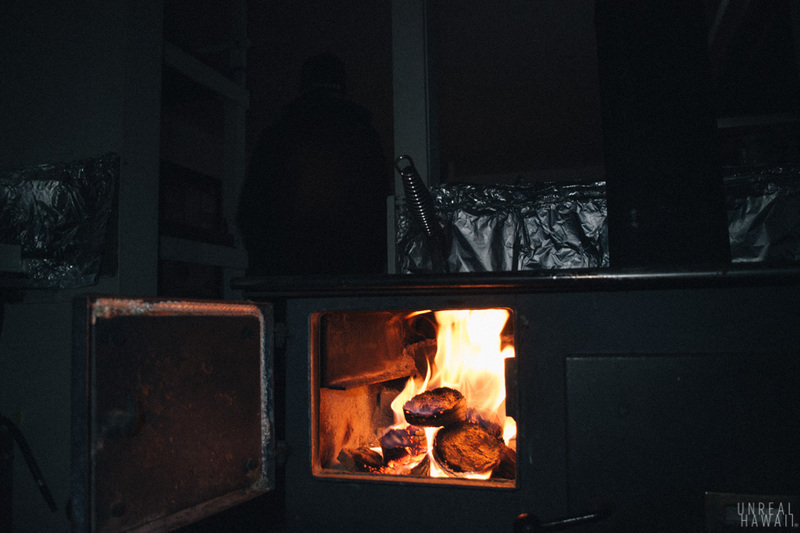 When night fell we lit a fire to warm the place up. There are instructions on how to get a fire going posted in the kitchen. Most of us slept in SnugPak Jungle Bag sleeping bags that they sell at SoulTrex. 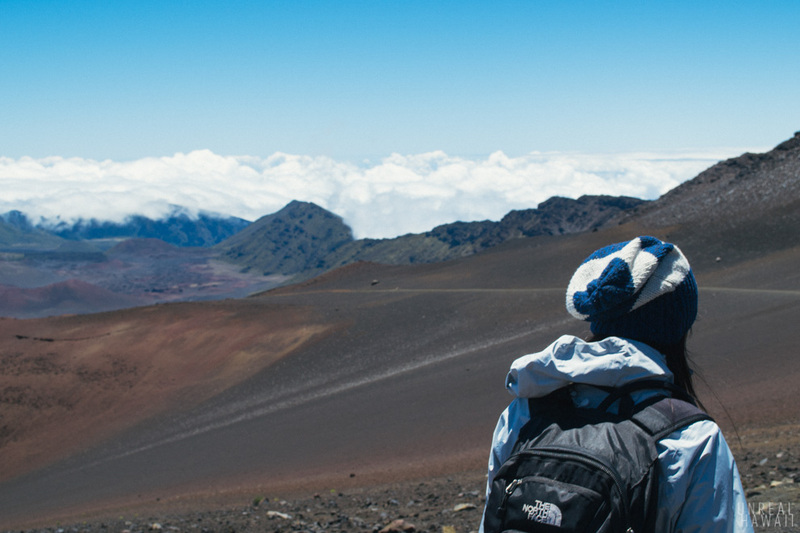 They’re not the warmest bags, but living in Hawaii, it doesn’t make much sense to invest in a warm sleeping bag. With a few layers of clothing on, plus the furnace, we were able to sleep without freezing. Remember, you need to get a permit to use the cabins and make a reservation a few months in advance. You can learn all about the cabins on the NPS site. Bring layers to prepare for cold nights and rain. Acclimate to the elevation before hiking. If you want to see flowering silverswords, you’ll have to come between July and October. 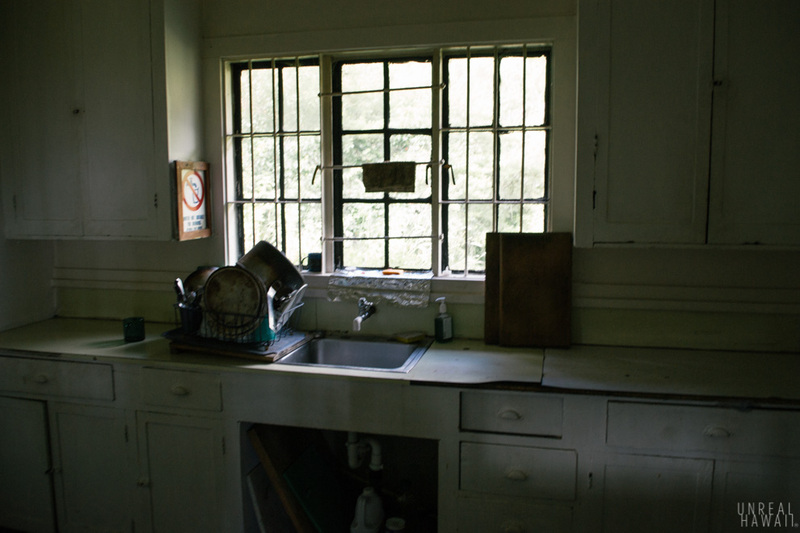 While there’s running water in the kitchen sink there’s no shower. You could use a wet wash cloth to wipe yourself off. We used camping shower wipes. Mostly focusing on just the three important regions. 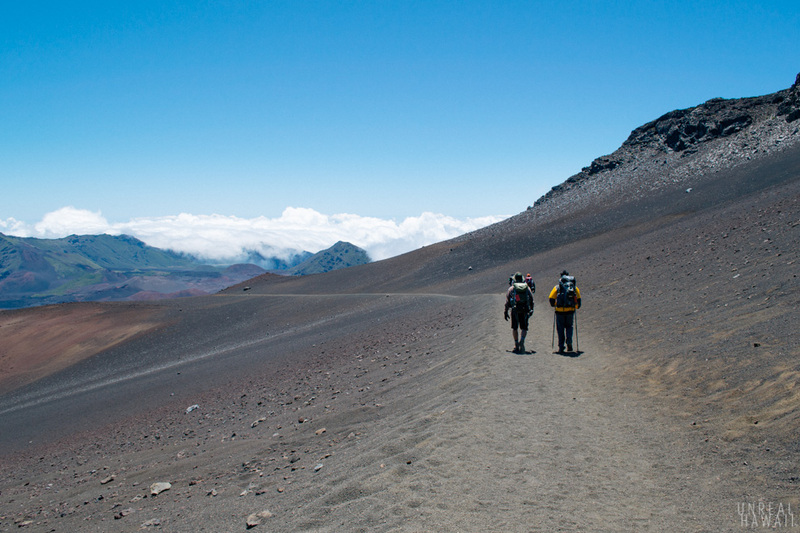 This is the first part of a three part series on backpacking Haleakala. 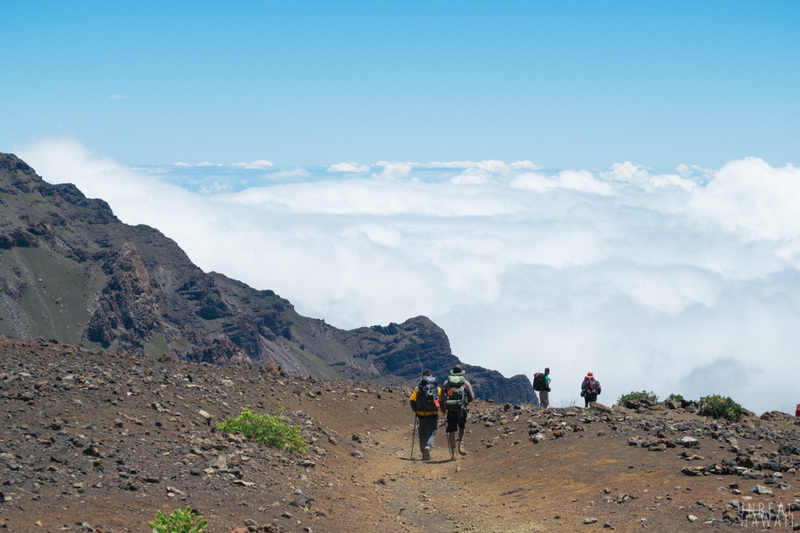 Each story will cover a day’s worth of hiking and activities. 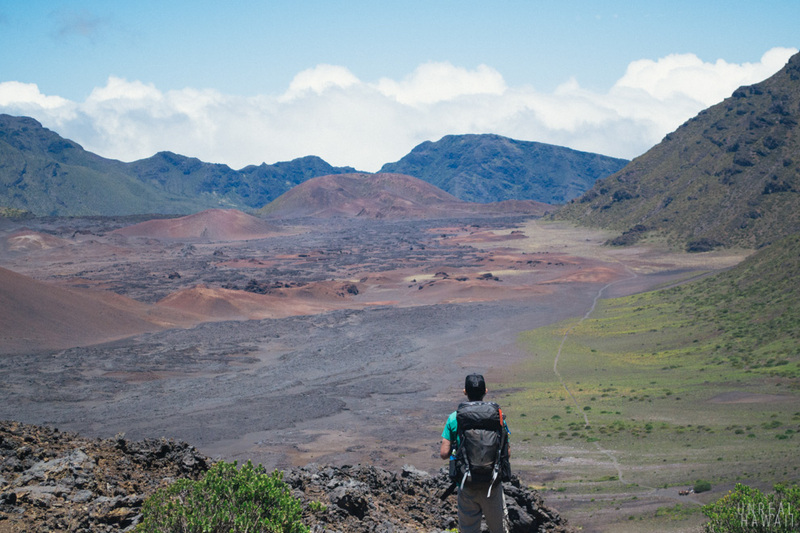 A story on Unreal Hawaii about a quick visit to Haleakala crater. 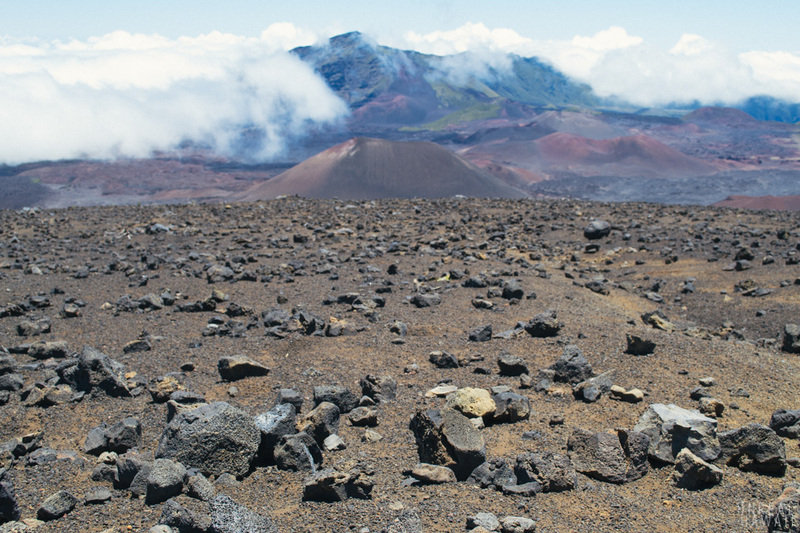 Map of Haleakala Crater (PDF).